Like a main commercial street, the boardwalk's prime location guaranteed a consistent stream of pedestrians, and boardwalk buildings were designed to entice strollers inside. 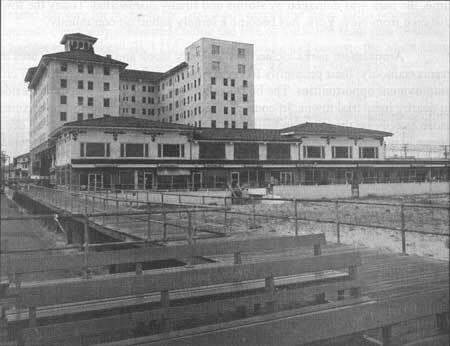 While serving as a promenade and a pedestrian marketplace, the boardwalk was also a place for community gatherings. The following case studies of buildings on the boardwalk illustrate the range of activities accommodatedfrom club houses for local sports organizations to amusement pavilions and bathing facilities. In general, boardwalk architecture adopted exotic "maritime" themes; fanciful reference to the sea and seaside pleasures was deemed appropriate for an architecture literally built into the sand and frequently sprayed by ocean breakers. The same year the stock market crashed, 1929, Atlantic City marked its seventy-fifth anniversary with the opening of Convention Hall (Fig. 69). Promoted as the largest of its kind in the world, the hall accommodated more than 40,000 persons and featured an organ with 32,000 pipes. The versatility of the structure was illustrated by its seasonal transformation into a winter ice-skating rink, a football stadium, a horse-show field, and a steeplechase track. 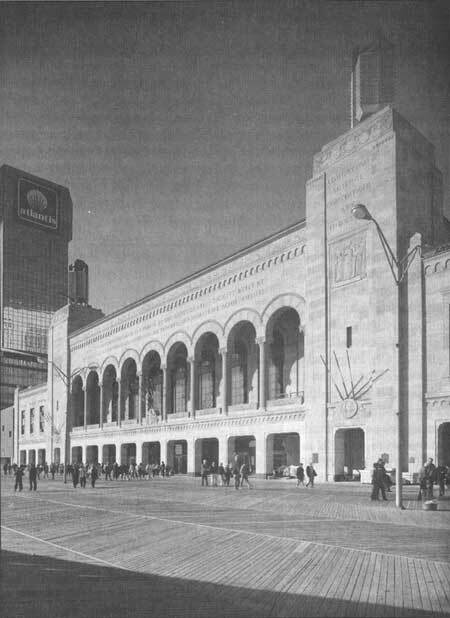 In the late 1980s, the convention hall underwent a $23 million dollar renovation in the hope of attracting lucrative conventions and sporting events. For more than fifty years, it has been most famous as the site of the Miss America Pageant. The history of the contest dates to 1920, when the "Fall Frolic International Rolling Chair Pageant" was held on the boardwalk. Today, the Miss America Scholarship Pageant draws large numbers of visitors to the area each September. An Atlantic City trademark, the modern Miss America Scholarship Pageant has also been the target of severe sexist criticism, hence the addition of "scholarship" to the traditional event. Figure 69. "Atlantic City Auditorium & Convention Hall by Night. postcard. Sarah Allaback. Figure 70. Atlantic City Convention Hall. HABS No. NJ-1130-4. Figure 71. Carousel, Seaside Heights. HABS No. OC-14.1 David Ames. The Seaside Heights carousel, of the Philadelphia school of carousel carving, with gentler expressions on the animals and realistic rendering, has been at its present site since 1932. 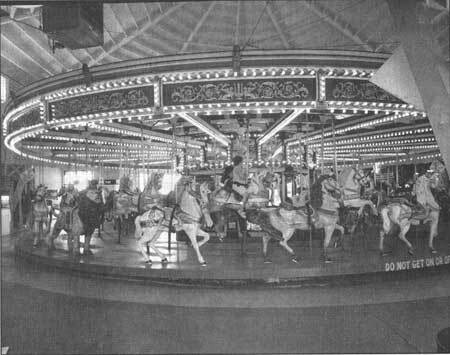 In 1928, Princeton contractor Linus Gilbert bought the carousel from an old amusement park, Burlington Island Park, on an island in the Delaware River between Philadelphia and Trenton. Burlington Island Park was heavily damaged by fire that year, and one of its developers, Robert Merkel, became involved in the Seaside Heights development, possibly through the sale of the Dentzel/Looff carousel. Gilbert constructed a ten-sided pavilion for the machine, but this exposed it to damaging weather, and the band organ induced complaints from some residential neighbors. It was also smaller and less elaborate than its Freeman competitor. At that time, the carousel was the only amusement at the boardwalk's north end, and its first years were lean ones. Within five years, however, L.R. Gilbert Construction Company incorporated the carousel into a larger arcade complex, including an olympic-sized swimming pool using chlorinated saltwater. 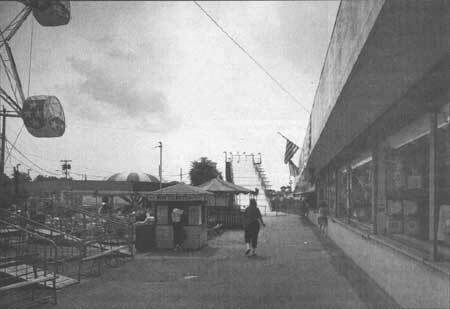 Later owners added attractions and enlarged the fishing pier, which evolved into Casino Pier. Today, Casino Pier and the pool are operated by a single owner. The pool was transformed into Water Works waterslide park in 1987. Early photographs and atlases from the 1880s show the Spring Lake beachfront scattered with small pavilions, bathhouses, and other recreational facilities. Over a fifty-year period, Spring Lake transformed itself into a model "city beautiful" resort community. The land around the lake was contoured to create a park-like setting, with rustic bridges, footpaths, and carefully planned landscaping. The grid of streets considered both lake and ocean views, as well as convenient transportation routes. Because it attracted wealthy summer vacationers, Spring Lake could afford Philadelphia's elite architects. Horace Trumbauer, Wilson Eyre, and Benjamin Linfoot all influenced the development of Spring Lake during the late nineteenth and early twentieth centuries. Among other amenities, Spring Lake provided its residents with stately bathing pavilions (Fig. 73). Today, these prominent boardwalk buildings continue to remind pedestrians of earlier seashore traditions like seabathing, and of a different era of city planning. Figure 73. Spring Lake, north beach pavilion. HABS No. NJ-1010. Figure 74. Belmar Fishing Club. HABS No. NJ-1079. Although the Belmar Fishing Club agreed on the need for a larger clubhouse, members disagreed over the design of the structure. In August 1928, club president Benjamin Farrier sent members a photographed rendering of a proposed club to measure 30' x 60' and cost $20,000. Almost residential in appearance, the two-story rectangular building was entirely symmetrical except for a substantial chimney at the north end of the house. The front facade faced the street, where the first story had three sets of french doors and a porch that wrapped around the building. The design was hardly appropriate for a sportsmen's facility. In response to this unsatisfactory proposal, member Paul Zizinia offered to donate a strip of land to the club under certain conditions, such as the use of fireproof materials. Although the club declined this plan for financial reasons, officials began to review more appropriate proposals. The mayor denied ever approving the first design and accepted a second plan better suited to the town's progressive aspirations. The publicity accompanying the clubhouse's dedication reveals some of the issues concerning aspiring resort communities. Belmar's small size did not diminish the municipal pride the city invested in its beachfront architecture. The town couldn't help but compare itself to Spring Lake, the wealthier resort immediately to the south, which had recently constructed a grand oceanside saltwater bathing pavilion and was planning a second. 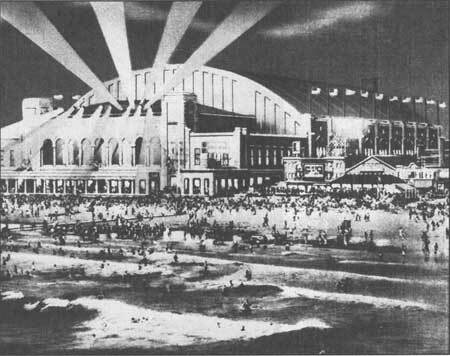 In the late 1920s, Atlantic City, Asbury Park, and Ocean City all built major beachside public halls. Although private, the fishing clubhouse evoked a similar sense of civic pride. A 1930 Coast Advertiser found that the organization generally supported Belmar affairs "not related to fishing, or to the club in any way,"  and the mayor associated it with funds he claimed to have invested during his administration in beach improvements. The stuccoed Spanish Mission design must have looked solid and enduring, as well as fashionable. One article observed that "in design it is modernistic enough to be attractive in the future as well as it is now." The style roughly resembled the Ocean City Music Pier, where the Spanish style also established a firm hold in the 1920s, and the Flanders Hotel, other boardwalk buildings, and private homes. The press admired certain design elements of the "palatial" buildingthe second-floor view, the breeze-catching porches, and the pier. External decorative detailssuch as the Head of King Neptune over the entry, the club insignia, and fish swimming on the walls in "realistic poses"were noted as appropriate to their setting because, "while designed essentially as a headquarters for anglers, the new clubhouse is of an architectural style that blends admirably with its marine background." Although certain aspects of beachfront architecture remained constantthe views and the emphasis on porchesthe Spanish Mission style met with the community's firm approval. The beach required a distinctive style (partly explaining rejection of the first design) beyond old-fashioned Victorian wood pavilions. Belmar's residents could feel that their fishing club competed honorably with Spring Lake's pavilion just to the South. 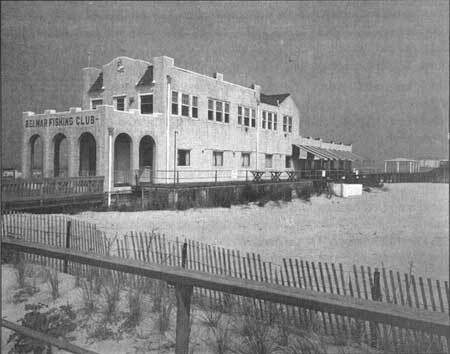 At the time of the new building's dedication, the Belmar Fishing Club numbered more than 500 members; its president, Benjamin Farmer, was also head of the Association of Surf Anglers Clubs of America and the Miami Beach Rod and Reel Club. Although the community "Welcomed a club composed of such prominence, wealth, and keen business conception," the organization was open to "sportsmen from just about everywhere and from all walks of life." With its large membership, low fees, and inexpensive equipment, the fishing club was probably more egalitarian than most contemporary private yacht clubs. While its more exclusive neighbor, the Little Egg Harbor Yacht Club in Beach Haven, held some of its early meetings in the largest auto garage on the East Coast (Ostendorff's), Belmar club organizers met in Reimuller's hardware store. The Belmar Fishing Club's ties with North Jersey, home to most of its members, implied a less prestigious background than those clubs with roots in New York and Philadelphia. However, the club clearly perceived itself as an elite organization; although he withdrew at the last minute, the governor was scheduled to speak at the dedication, and Herbert Hoover sent flowers honoring the occasion. A comparison of the boardwalks at Ocean City in Cape May County in the south and Keansburg in Monmouth County in the north, begins to suggest characteristic differences between south and north shore towns. Originally a Methodist resort, Ocean City developed around a carefully planned urban scheme; in contrast, Keansburg grew according to the whims and fortunes of the manufacturing companies its residents serviced. The Ocean City boardwalk offers a variety of shops, concessions, and amusements to visitors from throughout the state and nation. Like a carnival, Keansburg's boardwalk is centered around amusement rides and games; it is a local business catering to the residential community. While Ocean City makes a living as a resort, the Keansburg economy relies on other means of subsistence. The construction of Ocean City's first boardwalk in the 1880s inspired a long tradition of ocean-front amusements to entertain the expected crowds. A trolley line with connections by steamboat from Longport brought more traffic to the island between 1893 and 1929. 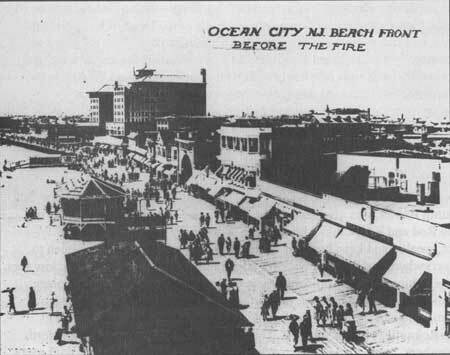 Beginning in 1911, the famous shore fast-line connected Ocean City with Atlantic City and its boardwalk. Although the original Ocean City walk was packed away during the winter months, a permanent concert hall, the Music Pavilion, drew visitors to year-round concerts and other events. After a 1927 fire devastated the boardwalk (Fig. 75), the music building was moved to Sixth Street and remodeled to serve as a convention center. 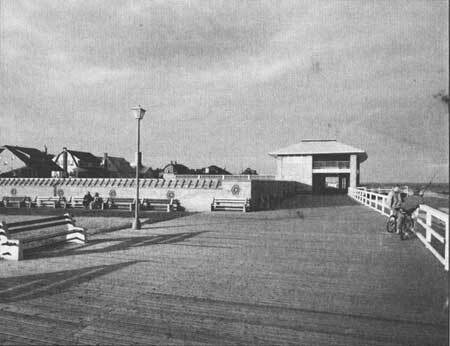 A Spanish-style, red-tile roofed "Music Pier" overlooking the sea from Moorlyn Terrace on the new boardwalk replaced the pavilion as the center of entertainment in 1929. The boardwalk was built with Seattle fir and California Redwood, and may have been the first in the nation constructed using concrete beams, girders, and support pilings. Since the destruction of the original Music Pavilion by fire twenty-five years earlier, the Music Pier has continued to be a commanding presence on the boardwalk, hosting a variety of annual events and housing several permanent offices. During the early twentieth century, architect Vivian B. Smith contributed two of the city's most significant public buildingsthe Neoclassical city hall on Ninth and Asbury streets, and the "collegiate Gothic" high school. She was also responsible for the more whimsical Hotel Flanders (Fig. 76), still reigning over the boardwalk at 11th Street. Figure 76. Hotel Flanders, Ocean City. HABS No. NJ-1116. Ocean City is no longer considered a religious resort, but it remains a dry town promoting "family values." Unlike Ocean Grove, the Methodist shore community to which it is constantly compared, Ocean City offers a variety of concession stands, games, and stores along its waterfront. A contemporary travel guide calls its boardwalk "the most pleasant, family-oriented one of the entire Jersey shore." Perhaps because of its conscious desire to preserve this reputation, Ocean City manages to absorb the slightly tacky in a liberal assortment of enticements and amusements; the boardwalk shamelessly offers blue cotton candy and arcade games alongside homemade cannoli and Music Pier performances. The used bookstore on Asbury Avenue, stocked with contemporary romance and adventure paperbacks, epitomizes the seasonal atmosphere of the place. Downtown, signs thanking tourists for visiting, and five-and-dime stores equipped with everything they forgot, also confirm the resort's family orientation. Keansburg is, "not recommended for those with high-brow intentions or the need for first-class facilities," one guidebook announced in 1986. But, with this caution in mind, the amusement park and its ancient rides could be "fun." Three generations of bumper cars, for example, are worn but working and amazingly mirror four decades of change in real automobile design. A kiddie train ride recalls the famous California Zephyr, even down to the way the cars are connected. The boardwalk, once two miles long, is now a black asphalt walkway, and the beach is littered with broken glass. 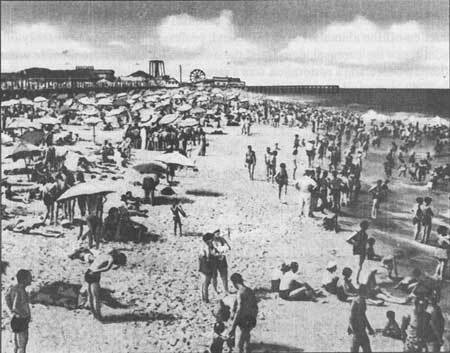 Seventy years ago, the Keansburg boardwalk (Fig. 77) competed with a nearby amusement park located at Union Beach. Like other bayshore communities, Union Beach's waterfront lacked the appeal of the ocean shore. Nevertheless, a small amusement area, Blue Bird Park, had developed along the shore by the 1920s; it offered a carousel, skeetball, and food stands to primarily working-class visitors. Over time, the park was damaged by storms and finally dismantled. Today the town, a convenient commuting distance from New York, has become a largely suburban community. Figure 77. Keansburg boardwalk. HABS No. NJ-1177-2. Amusement parks located in the Sandy Hook and Raritan Bay area did not need to develop a resort economy; their proximity to Perth Amboy and other manufacturing cities created different employment opportunities. The boardwalks provided entertainment for residents, many of whom worked in nearby industrial towns. In contrast, Ocean City, the Wildwoods, and similar cities further south relied more heavily on the resort industry. Over the years, as twentieth century demands increased, these cities began to market themselves as vacation destinations. Today, the visitor centers often market a chosen theme, attempting to draw crowds by promoting a unique "family," or "fifties" image.